Raffle Prizes: Drawings will take place at 2pm, 3:30pm and 4:30pm on the Main Stage (corner of Park and 60th). The grand prize is a getaway trip for two to Paris, and other great prizes in the categories of travel, lifestyle, beauty and shopping, and food and drink will be drawn. Tastings: The Bordeaux Wine Council will be sponsoring a wine and cheese tasting at the FIAF Gallery (22 E. 60th) from 12-5:30pm with cheese provided by Lactalis Deli and beer in the FIAL Lobby courtesy of Kronenbourg. Street Entertainment: Feel as if you’re standing on the streets of Paris with the live mime act (12-6pm), accordion music (1-5pm), the “Tour de France” race with stationary road bikes (12-6pm), the “Garcons de Café” race (competitors dressed as waiters carrying trays; 12-1pm), and the Citroën Car Show (1-6pm). Live Performances: Get a taste of different French musical genres with performances by Pierre de Gaillande, Les Sans Culottes, and Malika Zarra. The performances will take place on the Main Stage from 12-6pm. Kids’ Activities: Les enfants will love the lawn bowling tournament, face painting, arts and crafts, festival booths, can-can dancers, and more. Bar Artisanal: Enjoy Terrance Brennan’s new TriBeCa tapas hot spot. Indulge in the pissaladière (French style pizza), pork belly, or the array of delicious cheeses. Bouchon Bakery: On July 14, Chef Thomas Keller salutes France with his special Bastille Day tasting menu. Enjoy French classics such as merguez with baguette, moules au safran, macaroons, and chocolate crepes while sipping wine and champagne and listening to the soothing sounds of Kathleen Landis and quartet. Admission is $65 per person. La Bonne Soupe: With La Bonne Soupe's recent re-opening in its new bi-level space, guests are invited to enjoy a variety of French favorites off the regular menu such as salad Nicoise, quiche Lorraine, pommes frites and more. Two special menus include one with French onion soup, salad, dessert and a glass of wine for $17.25 or the three-course prix-fixe dinner for $23.95. 48 W. 55th Street, 212-586-7650, www.labonnesoupe.com. Le Relais de venise L'Entrecote: You may be in the Midtown location of this Parisian brasserie, but you'll feel like you're in France as you enjoy the $24 prix-fixe menu. Try salad with nuts and mustard vinaigrette and steak frites, a house specialty. Come see why Time Out New York critics voted this restaurant as "Best French for the masses." This entry was posted on Sunday, July 11th, 2010 at 11:24 am	and is filed under Stuff to Do. You can follow any responses to this entry through the RSS 2.0 feed. You can leave a response, or trackback from your own site. Thanks so much for posting this. I’m on my way to 60th St. now! Hope to see you there! 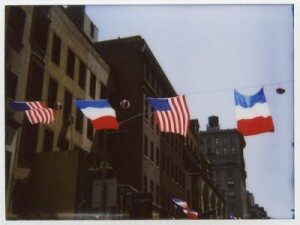 How did you enjoy the Bastille Day celebration? The kids had a lot of fun, but I know what I will enjoy the most is Bouchon Bakery on Wednesday Thomas Keller is one of my favorites!!! Yes, that would be fine. Please give attribution to Meryl Pearlstein of AllNY.com. Thank you.